The denizens of Floating Sheep space are beginning to explore Twitter and there is a need to experiment with the API interface and various datasets. So what better way to do this than to use zombies! So that we can visualize "a zyberscape of zweets"! Ate Poorthuis (a Ph.D. student at the University of Kentucky) spear-headed (pun intended) the zombie data collection process, which is relatively straightforward. The method was to use Twitter's Streaming API to download all zombie-related tweets between October 28 and October 31. We collected all messages containing references to zombies, undead and the apocalypse which appeared at a rate of about 45 tweets per minute for a total of 230,000 tweets. That's a lot of zombie angst! We also thought it would be interesting to look at other forms of zombie-tude and turned to the fount of all knowledge to search the term "zombie politician" which returned many references to Newt Gingrich. So we added Newt to the list of search terms. Unfortunately there were so few geocoded tweets referencing Newt (perhaps lending some credence to the zombie politician label) that the resulting map looked as sparse as the teeth in a .... wait for it .... zombie. Rimshot! Unfortunately, only 1.1% of those tweets were geocoded. While the profile of each Twitter user also contains a user-defined location field we decided to only use the coordinates of the actual tweet. These can be generated by a GPS-enabled phone or by 'smart' Twitter clients. Most tweets are geocoded to a specific point but others refer to a polygon (e.g. a city), in which case we've used the centroid of the polygon. And for those interested in a closer look at the U.S., please see below. 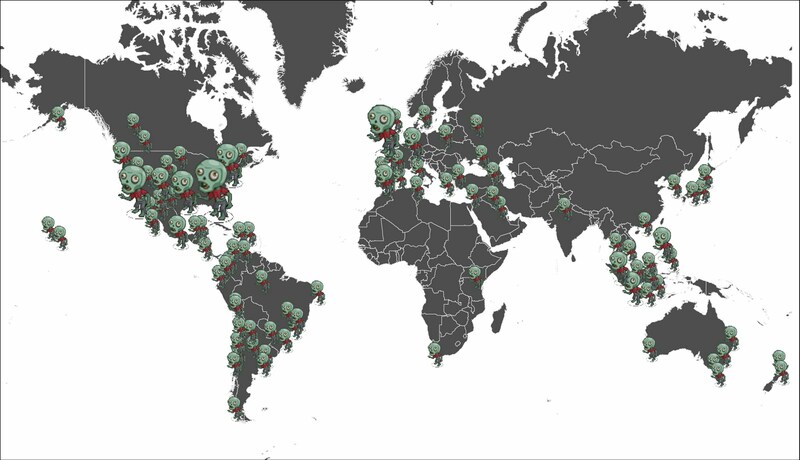 Location and Relative Amount of Tweets referencing Zombies (Zweets) in the U.S.
 OK, there are probably lots of other and better ways to do this, but its Halloween! This post is a bit eclectic, but represents a series of recent publications that do a great job of capturing what we find so fascinating about how information and materiality are in constantly shifting and mutual constitutive flux. First, visualizations based on satellite images. They are some wonderful representations of both the mobility (roads, air traffic) and information flows (undersea cables) of the 21st century. These images show a vision of the world that is borderless and strongly interconnected, albeit with some clear hubs and hinterlands emerging. In contrast, although not in contradiction, to this vision is Frank Jacobs' essay, "In Praise of Borders", which strikes a chord with our own work (see here or here), on the extent to which borders in the material world are replicated in the geoweb. Jacobs writes, "...we find enclaves and exclaves, disputed and neutral zones, improbably straight and impossibly jagged borders, deadly borders born in war and old ones almost faded into irrelevance. Borders reflect humanity’s need for obstacles, for a line in the sand between Them and Us. And even if they coincide with rivers or mountain ranges, they remain entirely human constructs. They are there because we expect them to be, because the map says that they are. They can be as wondrous, frightening and magical..." The argument that borders matter even in a hyperlinked world resonates deeply with us. Finally, a post by Richard Flordia in the Atlantic Cities which plays with some of the data that we pulled together for the Price of Weed Analysis highlights both the spatial complexity of human activity and the potential insight that thinking through usual questions can bring. All in all, lots of food for thought. Beer is no laughing matter. Wars have been started over less...and what about bar fights? Granted we're usually hiding under the table when the glasses start flying but we are certainly not laughing. And while just saying "beer" to the bartender will likely work in most of the world, you don't want to be stuck asking someone for a beer who only knows آبجو (Persian), or asking for a piwo (Polish) when all they've got is 맥주 (Korean). 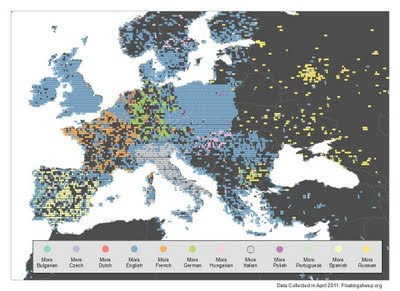 To aid the faithful followers of the Floating Sheep in their ongoing explorations in landscapes of liquid lubrication, we present the following geolinguistic guide to Europe's landscape of beer. Because simply mapping references to beer in the world's most spoken languages yielded a relatively homogeneous result due to the significant number of references to "beer" and "ale" in English, we thought a more locally specific analysis would be appropriate. So we instead mapped references to beer in twelve languages spoken primarily in Europe that were not included in our earlier map. And while this map obviously doesn't include all of the many languages spoken on the continent, these languages were chosen because of their relative prominence within a larger sample of languages. As we would expect, many countries are dominated by references in their native languages -- Denmark, Poland, the Czech Republic and Hungary display patterns that closely mirror the political borders of the material world. However, it is the discrepancies where the digital transcends the material expectations that present the most interesting findings. For example, there is an abundance of references in Romanian, even infringing on the virtual territory of Italy, Spain and England (though Spanish and English aren't included in this comparison). While we can have no certain answer, perhaps this is because the Romanian word for beer is "bere", which could of course be an understandable typo for the English-language word. Similarly, Dutch-language references not only fill the entirety of the Netherlands, but also Germany and a not insignificant portion of France. Even Lithuanian references are prominent throughout the Baltic states, despite Estonia's prominence in the global information economy. Despite the usefulness of this particular grouping, it remains useful to consider how some of the most spoken languages in the world stack up to these more country-specific languages, so in the map below we reintroduce references in English, as well as references in German, Portuguese, Russian and Spanish, to some of Europe's more widely spoken tongues. Use of English as a second language by many native Europeans in creating user-generated placemarks, signaling the increasing use of English as a global language. Creation of content in English by native English-speakers traveling throughout other parts of Europe. Concerted efforts by beer-serving establishments throughout the continent to present English-language content online, so as to attract more English-speaking tourists as patrons. 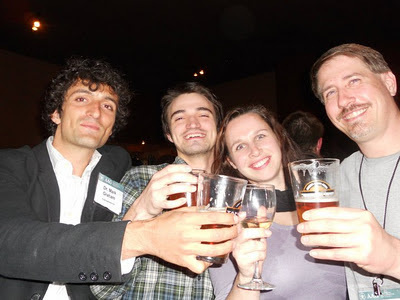 While these are not testable hypotheses with our current dataset, the results strongly support the idea that the cyberscape of beer is impacted by the forces of globalization, especially in the creep of geolinguistic uniformity. We can only hope that this creep is limited to to linguistics, rather than beer making techniques. At the same time, however, it is also evident that there remains a considerable amount of content in the local languages of many countries across Europe, and it is unlikely that such ties to local language will disappear. This should be good news for the Trappist and Lambic beers of Belgium and the Světlé and Černé beers of the Czech Republic! So while it is always good to learn the local term for beer, the English word seems likely to get you what you were looking for. Or you can try our technique which is to start a bar fight and while everyone is distracted, grab someone's glass and hide under the table. Smaller in that they were not one of the world's ten most spoken languages (by # of native speakers). Antonella Rondinone and Monica have developed a survey mechanism to understand the discrepancies in who contributes user-generated geographic information. We have blogged about this before, but determined that there is no real answer to as to why demographic difference exists in volunteered geographic information. So, please help us out and give us information about what content you help generate. Please pass this along to your friends, parents, neighbors, teachers, students, facebook-friends, twitter-followers, acquaintances, enemies, frenemies and everybody else that uses the internet. Now that we've gotten mapping soft drinks out of the way, not to mention other mind-altering substances, it's time we get back to good ole fashioned beer. But rather than mapping different colloquial terms for beer, as we did with pop/soda/coke, we return to our long-standing interest in investigating how different socio-linguistic groups are represented in the geoweb. Only this time, we do it through the proverbial lens of a pint glass (which happens to resemble the geoweb in its distortive capabilities). 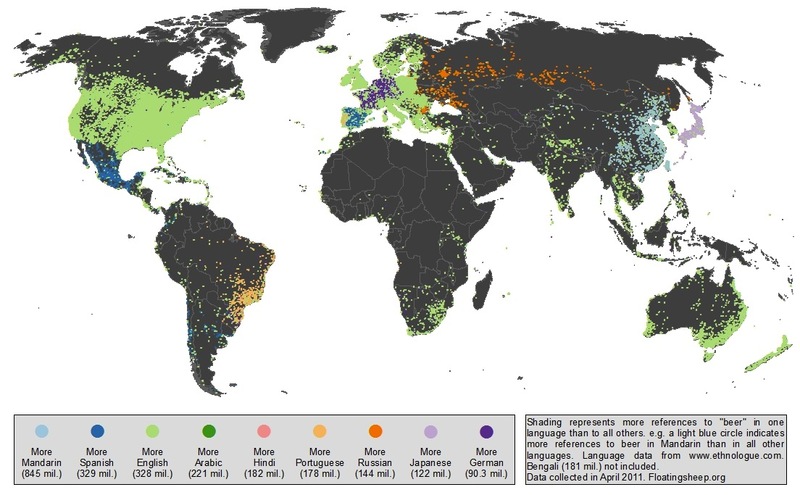 The below map shows the relative prevalence of the word for beer in the world's ten most spoken languages (by # of native speakers). However, because of the fact that there were no points at which the number of references in the world's sixth most-spoken language, Bengali, were greater than references to each of the other nine languages, we have excluded Bengali in this particular case. So while we're sad to see Bengali left off the map, the fact that a language with 181 million native speakers has so few references to "beer" is telling of either vast inequalities in the way Bengalis are represented within the geoweb, or perhaps just their general distaste for beer. While many of our maps are extremely clear in showing that the content within the geoweb reflects traditional state borders, mapping references to beer leaves a much hazier picture. So while most of the content in Russia is in Russian, China in Mandarin, Japan in Japanese, Germany in German and Portugal and Brazil in Portuguese, the cases presented by English and Spanish references are much less clear. Spanish, the world's second most represented native language, spoken throughout nearly the entirety of the Americas south of the U.S.-Mexico border (not to mention the actual country of Spain), has relatively few references compared to the land mass of countries in which Spanish is spoken. Indeed, outside of Spain, Mexico, Chile and Argentina, there are relatively few points in the world at which there are a significant number of references to "cerveza" compared to references in other languages. In fact, many places in Latin America have more references in English than in Spanish (or any other language). This appears to be reflected significantly in Europe, as well, where English appears to be the default second language of the geoweb in many of these countries. As a follow-up map will show, when including more nationally-defined languages such as Italian, Polish, Dutch, Danish and Hungarian, these respective countries show a significant preference for their own terms, as one would expect. When in Europe, Just Ask for "Beer"
Zooming in to Europe only further accentuates the relative dominance of English among these languages, with significant portions of Portugal, Spain, and Germany even showing more references to beer than in their native languages. Interesting, however, that much of France is a mixture of English and German references, even in the much more southern portions of the country. Whether you want something cheap, something a bit fruity, something hoppy or something to just make the pain go away... our results clearly show that no matter where you may be in the world, it's a safe bet that if you just say "beer", the bartender will probably know what you mean. It's a question that will never have any definitive answer, try as we might to analyze it's fullest depths. Of course, we're talking about what one calls a carbonated beverage. Thanks to the earlier work of fellow geographer Alan McConchie, the aptly named "The Great Pop vs. Soda Controversy", there remains a solid baseline for analyzing the spatial variations in what one calls a carbonated beverage -- does one prefer "pop" over "soda"? or does a vaguely specific "coke" suffice to account for all other carbonated drinks? 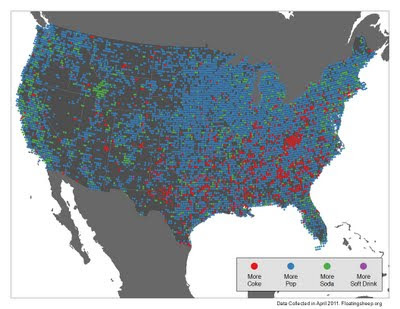 The map below, created using the survey data Alan collected, breaks down the usage of pop, soda and coke, as well as other generic terms, by county across the United States. Unsurprising to anyone who has ever had an unnecessarily long debate with a friend or acquaintance about whose terminology was more correct, there are very clear regional differences in the words used to describe those oh-so-tasty beverages. While the south prefers "coke", much of the northeast, along with pockets along the west coast, the Missouri-Illinois border and eastern Wisconsin go for "soda", while pretty much everywhere else from western New York to the Pacific Ocean uses "pop". And while there are obviously some very linguistically conflicted places (e.g., Alaska), the map generally conforms to the anecdotal evidence that many, including myself, have gathered over the course of many asinine arguments. Doing as we like to do, however, we thought we'd complicate the picture a bit. Whereas the data for the above map was pulled from a voluntary survey, we thought we would deploy the collective intelligence of the geoweb, as represented by references to particular keywords in the Google Maps database, to make our own map. In addition to the usual pop, soda and coke, we included references to "soft drink" in the map. Draft versions of this map also included references to "fizzy drink" and "carbonated beverage"; alas, there were so few references to these keywords that there was no point in including them. The most evident thing from looking at the map of Google Maps references is that it does not clearly conform to the survey data shown in the first map above. While references to "coke" are obviously most prevalent in the south, as with the original Pop vs. Soda map, they are prevalent to a much lesser degree. After that, the whole thing starts to unravel a bit. While there are a significant number of places where references to "soda" are greater, they do not have any clear spatial pattern. This appears to largely be due to the simple dominance of references to "pop" across the country. Although "pop" can clearly have a wider variety of meanings than "soda" or "coke", whether a nickname for a father or grandfather, an onomatopoeia or a verb, among other uses, it's not exactly clear why these would lead to such a larger number of references across the United States. Although the explanation is probably overdone at this point, the Floatingsheep Collective remains suspicious of nefarious plots to significantly alter the content indexed by Google Maps in a show of digital imperialism. In this case, various tribes from Seattle across the Great Plains to Chicago and through the Rust Belt to Buffalo have banded together in order to achieve some final resolution to the great debate of what one should call a carbonated beverage. Violence is not the answer folks. Let's all just sit back, relax, and have a coke.